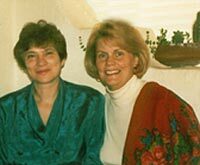 The International Humanitarian Center ROZRADA was founded in 1994 through the common efforts of Ukrainian psychologist Valentina Bondarovskaia, Ph.D. and American psychologist Janae Weinhold, Ph.D., Co-Director of CICRCL. The two colleagues and friends who were guided by ideas of good, love and the desire to help everyone who is in need. Over the past 22 years, Janae has offered numerous trainings through CICRCL and ROZRADA in codependency, counterdependency, conflict resolution, developmental systems theory, developmental process work, healing developmental trauma, domestic violence and couples counseling. She finds Valentina and her Ukrainian students to be outstanding collaborators in refining the cross-cultural aspects of the work she and Barry do together. In 1997, ROZRADA translated and published the Russian edition of Breaking Free of the Codependency Trap. In 2009 ROZRADA translated and published the Russian edition of Counter-dependency: The Flight From Intimacy. Click here to view ROZRADA’s website. Valentina and Janae are working on other collaborative projects for 2013 and beyond. Check back here for news and updates.